Our mission is to develop powerful shipping management tools that make the lives of eCommerce merchants easier. A leading developer of innovative eCommerce products since 2008, WebShopApps produces a wide range of shipping extensions currently in use on tens of thousands of Magento sites worldwide. Proudly serving Web Design Agencies, eCommerce companies, and independent developers, our consistent track record and dedication to the Magento community has earned us Magento Platinum Industry Partner status. Ready to run a tighter ship? Contact WebShopApps today to discuss your company’s unique shipping goals, or explore the site to learn more about our growing line of top-tier products. Above all else, WebShopApps is in the business of problem solving—helping eCommerce merchants address any and all variables that may impact their ability to serve a customer. This starts with the creation of easy-to-use, fully adaptable shipping extensions, and continues with the personal dedication of the WSA team to the thousands of clients that depend on us. Rather than trying to sell you the flashiest or most expensive option, our goal is always to provide you with the right product for your needs. And once you’re set up, our responsive customer support services and extensive knowledge base are here to help keep things running smoothly. WebShopApps UK is based just outside London in a charming seaside town called Leigh-on-Sea. WebShopApps US opened in August of 2013 in Dublin, Ohio, with CEO Karen Baker leading the team across the pond. In addition to our UK & US offices, we have a developer based in Perth, Australia. We may be in different locations, but WebShopApps has remained a close-knit and highly focused team. Everything you've ever wanted to do with your shipping rates is here in one place! Finally! 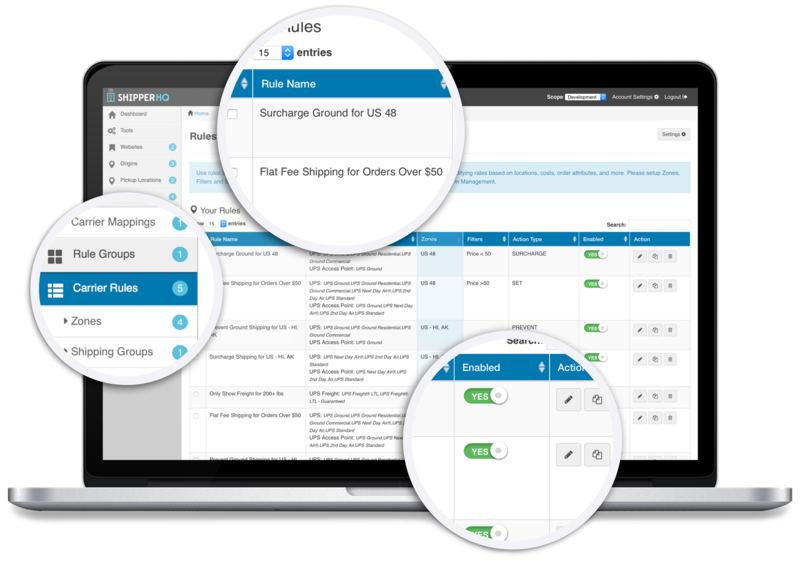 Manage all of your Ecommerce shipping rates and options from one place. See How! Sign Up for the latest WSA News!